Vintage Gold Plated Rhinestone clasp with vintageJapanese beaded extender. Large vintage intricate filigree centerpiece with crystal Rhinestones and mottled black/gold/white cabacon. Fabulous handmade clear Venetian Glass discs, textured nuggets with beadcaps, and large leaves, all with 24kt gold foil inserts (2 of each). Handmade Lamp worked Gold foil striped glass flattened round. Vintage Czech glass hand painted and manually pressed floral button. Beautiful vintage handmade Venetian Glass Sommerso round beads (1 large, 2 small), and 'lentil' disc with black and aventurina inclusions. 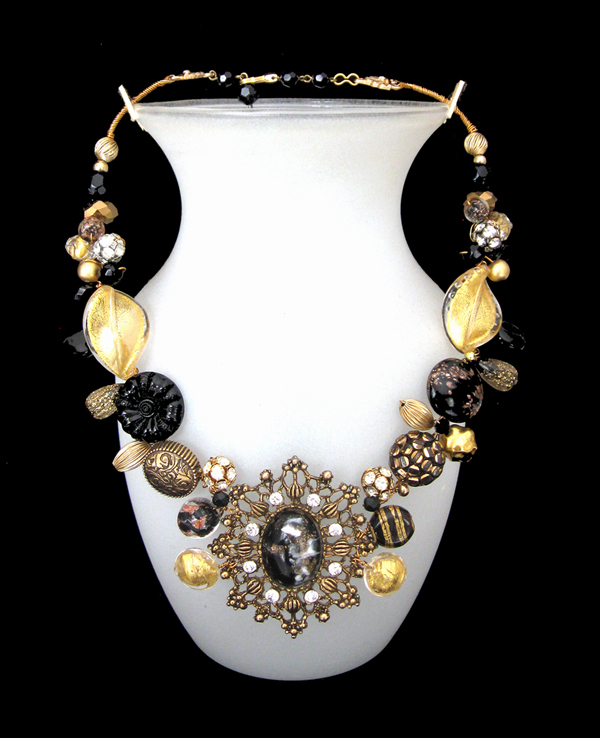 Vintage German black and gold faceted button. Vintage "Deauville" gold Lucite nugget. Vintage Swarovski Chrystal Rhinestone "Ball" beads (2 silver, 2 gold). Vintage Japanese matte gold Lucite rounds (2 + 1 on clasp). Czech glass jet Briolettes (2). A variety of vintage German glass and Japanese Lucite faceted Jet Black beads. Vintage "Monet" corrugated twist Gold Plated rounds (2). Metallized gold faceted glass rondelles (2). Vintage gold embossed "coin' bead. Ribbed Lucite black and gold glitter pear shapes (2). Vintage corrugated gold ovals (2).